It’s no understatement to say that anglers spend their time in British Columbia fishing in one of the most beautiful places on earth. Described by many as “spectacular by nature,” the wilderness of the Pacific Northwest is characterized by lush, tall forests, crystal clear streams, and mountain ranges where few people have set foot before. Saltwater anglers can indulge in 1,600 miles of coastline, including plenty of drive-to destinations in the southern part of the province as well as remote wilderness up north. Some of the most abundant fisheries are only accessible by plane, which is why you’ll find literally hundreds of fly-in fishing lodges at your disposal. 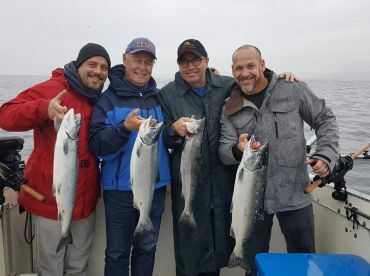 Several days by the sea gives you a chance to reel in 5 species of Pacific Salmon, Halibut, Lingcod, 14 species of Rockfish, and several kinds of delectable Crab. On the other hand, freshwater anglers can cast a line in thousands of lakes and hundreds of rivers featuring Steelhead, Salmon, and various Trout. British Columbia is a fly fishing paradise that is equally rewarding for those who are eager to hook into a “dinosaur” Sturgeon weighing hundreds of pounds. 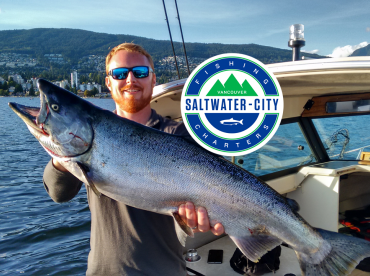 All in all, this corner of the world has something for everyone, and plenty of BC fishing charters to help you make the most of it. 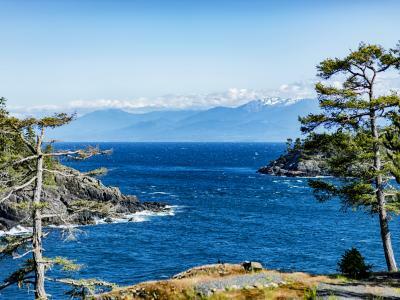 Also known as the Queen Charlotte Islands, this collection of islands is the focal point of BC’s northwest coast. 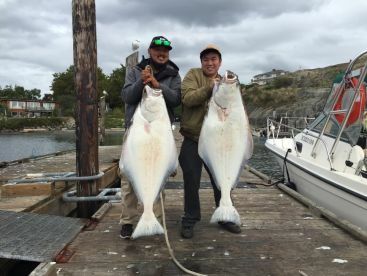 Anglers make their way here each summer for the most productive Halibut and Salmon fishing in the province. There are few places where you can catch a “barn door” Halibut and 60+ lb Chinook Salmon in the same day, let alone the same trip—and Haida Gwaii is one of them. 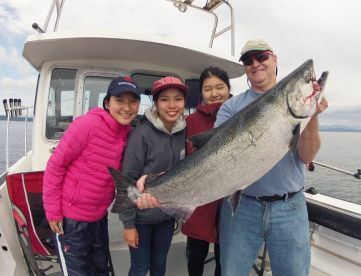 The biggest Tyee Salmon (Chinooks weighing 30 lbs and above) appear twice during the summer season, typically in May or June and again in August. 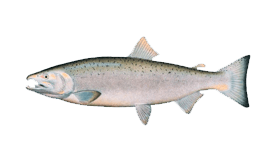 At the end of summer, Coho Salmon are also abundant here. Over time, the remote shores of northern BC and her islands have become more accessible, allowing anglers to take advantage of these abundant waters. Haida Gwaii is accessible by plane from Vancouver Airport or by floatplane from Prince Rupert. You’ll find no shortage of BC fishing lodges here, which provide guides, gear, and fish packaging for your journey home. Weather can be volatile so come prepared and keep an eye on the forecast. Vancouver Island boasts some of the best Salmon fishing BC has to offer. Actually, it’s some of the best in the world, whether you’re targeting these fish in freshwater or saltwater. Each year, Vancouver Island sees millions of Salmon as they return to the rivers to spawn. Anglers here catch Chinook, Coho, Sockeye, Pink, and Chum Salmon. 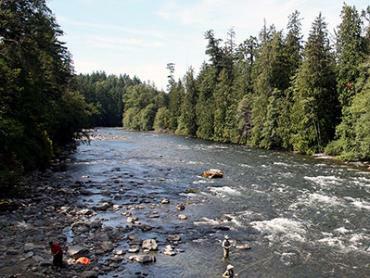 Many consider the Campbell River on the east side of the island to be the “Salmon Capital of the World.” In addition to all 5 Pacific species, this river hosts massive Tyees in late summer. During peak season, the Campbell River grows crowded with over 500 guides and hordes of visiting anglers. Anglers fishing on the west coast of Vancouver Island can enjoy less fishing pressure and get a head start on local Salmon runs. 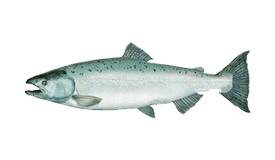 Small feeder Chinook are biting year-round in most bays, joined in succession by larger Chinook, Coho, Sockeye, Pink, and Chum Salmon as summer progresses. 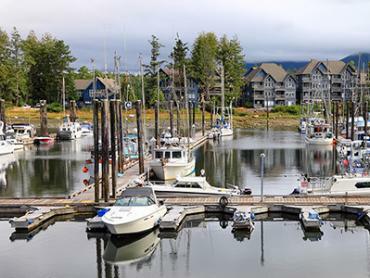 Premier fishing destinations on Vancouver Island include Port Hardy, Port Alberni, Tofino, Ucluelet, Sooke, and Victoria. 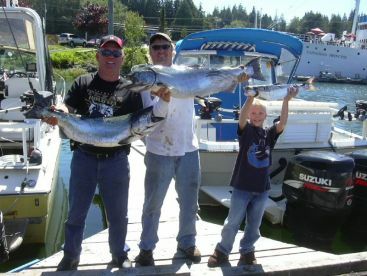 Port Alberni is known for its astonishing run of Sockeye Salmon each summer, in addition to millions of other Salmon. Depending on who you ask, this small town at the heart of the island is the rightful Salmon Capital of the World! For excellent feeder Chinook fishing all through winter, head to Victoria. Located to the northeast of Vancouver, the Fraser River is historically one of the most important Salmon rivers in the world. These days, one of the main attractions here is White Sturgeon, the planet’s oldest and largest freshwater fish. The lower Fraser is wide, shallow, and slow moving, where anglers target large Sturgeon as they spawn. In the portion above Hope, the water flows rapidly and foams. The sand-bottomed pools between rapids are exactly where large Sturgeon like to lie, which means eager anglers are right behind them. Lillooet is a go-to destination for anglers interested in getting a taste of the sturgeon fishing BC is known for. Fishing for this species is strictly catch and release. Though underrated by comparison, the Pitt River also offers an outstanding British Columbia fishing experience. This river meets the Fraser just south of Coquitlam and is one of the last rivers in the region with large runs of wild Salmon and Trout. Winter Steelhead reach their peak here from February to March, joined but Bull and Cutthroat Trout. Located just 40 miles from the ocean, Sockeye runs also make their way here in as little as 24 hours. Fishing in the Pitt River is strictly catch and release. Other rivers in the area with good Salmon and Steelhead fishing include the Vedder and Capilano Rivers, just 2 hours from Vancouver. The Okanagan Valley in southern BC stands out from other fishing grounds, mainly because its unique environment lends itself to a different kind of fishing: fly fishing in magnificent lakes for the iconic Kamloops Trout (a local variety of Rainbow Trout). This valley is home to the big Okanagan, Kalamalka, and Skaha Lakes, which boast good spring and fall fishing for large Rainbow Trout and Kokanee Salmon. Various other lakes in the area offer good fishing for Kamloops Trout. Light tackle and fly fishermen can have a blast catching this fish in numerous local waters, including the Tepee, Hathueume, Oyama, Postill, Swalwell, Beaver, Bolean, Pinaus, Spa, Arthur, and Aberdeen Lakes. If you’re looking to experience the best Trout fishing BC has to offer, head to the aptly named city of Kamloops. This town is surrounded by a handful of lakes with outstanding Kamloops Trout fishing. In fact, the fishing is so good that numerous local high-country lodges came together under the “Rainbow Capital” banner. Kamloops Trout make for some of the best fly fishing you can get, which is why three of the lakes here were previous venues for the World Championship of Fly Fishing. 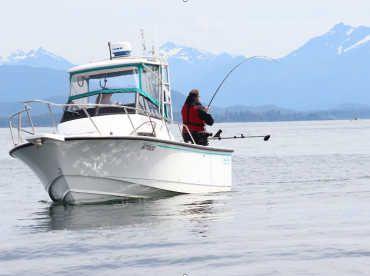 BC fishing charters typically provide gear, bait, and other necessities. In some cases, the crew may also provide fish cleaning and packaging so you can travel home with your catch. Anglers must buy a fishing license, either for saltwater fishing or freshwater fishing. Additional stamps for Salmon and Steelhead may be required, depending on where you fish. You can purchase a BC fishing license and necessary stamps online. Not all species are open to harvest year-round. 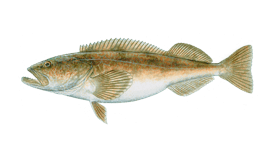 The season for Halibut and Lingcod typically closes at the start of the year until April or May, but this is subject to change each year and does not apply to all locations. Sturgeon fishing in BC is strictly catch and release. You can learn more about local regulations by region depending on where you plan to fish. As always, hiring a local guide is the best way to fish responsibly and to discover everything British Columbia has to offer! Rivers provide some of the most productive fishing in BC at the start of the year. Catch winter Steelhead and a variety of Trout, or look for a Sturgeon fishing guide who runs winter trips on the Fraser. Winter Steelhead are at their peak in the rivers. 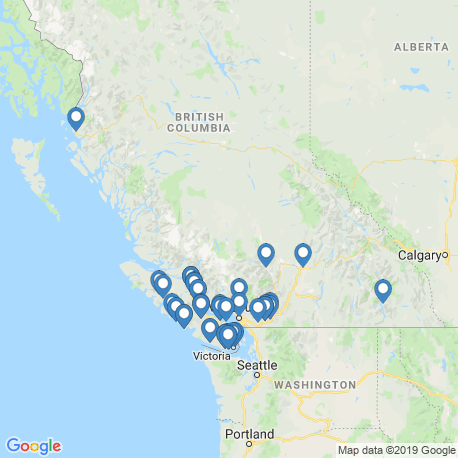 Many charters on the BC coast are still shut down for the winter, but a few may be willing to take you out for Chinook, Crab, and more. As spring approaches, local charters and guides start preparing for the season. Sturgeon fishing on the Fraser River is picking up momentum, while Steelhead fishing stays strong. 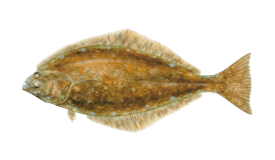 In some years, Halibut and Lingcod may be open to harvest in April. Even when they aren’t, fair weather can provide the perfect opportunity to squeeze in a little nearshore Chinook fishing. BC’s saltwater fishing season gets underway in summer, with Lingcod, Halibut, and plenty of other fish biting. Up in Haida Gwaii, anglers are catching the first Tyees of the season. Head to Port Alberni for the infamous Sockeye run, when millions of the most delicious Salmon species flood Alberni Inlet! Offshore, anglers are bottom fishing for Lingcod and Halibut. Come July, Coho Salmon are at their peak. Anglers are still hooking into massive Chinook and Halibut on the west coast of Vancouver Island and up north in Haida Gwaii. August in BC is all about Salmon! All 5 species are making their way to the rivers, giving anglers non-stop action everywhere they turn. 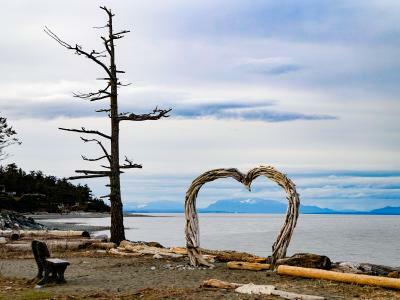 Try your luck in Campbell River, or anywhere on the coast. You’ll be spoiled for choice in September, with no shortage of Salmon, Lingcod, Halibut, Sturgeon, Steelhead, and Trout at your disposal. Now’s the time to try something new! The summer Salmon runs are coming to an end, but the fishing is still good in October. You’re less likely to hook a Halibut offshore, but crabbing can be excellent. By November, many charter boats start shutting down for the winter. Fishing for Chinook in Victoria is still good, however. In the rivers, Sturgeon and Steelhead are still biting. Sturgeon fishing on the Fraser is no longer at its peak, but can be relatively good if you find a guide willing to take you out on the river. Winter Steelhead fishing is the main source of action now. "Four Texans out with Captain John"
"Morning run to the Coho grounds, fabulous day from beginning to end!" DRESS WITH LAYERS AS THE WIND COULD GET CHILLY!